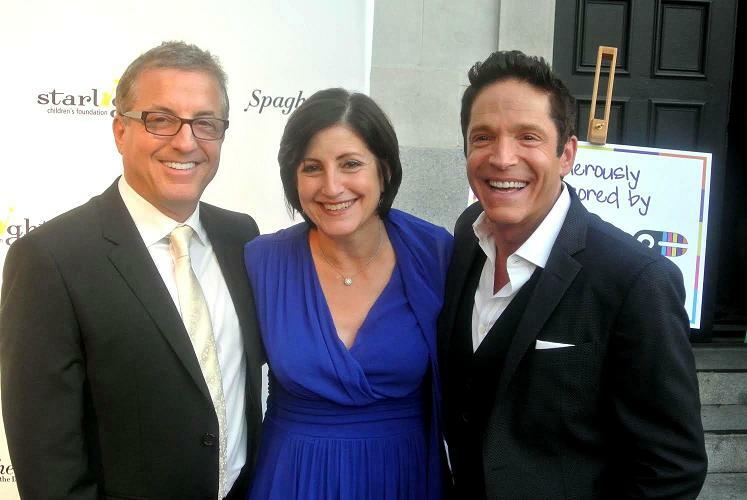 The Koz family: From left to right: are Jeff Koz, Roberta Koz and Dave Koz. “Giving in the name of children is a wonderful way to spend an evening…” said young actress, Sierra McCormick. Starlight Children’s Foundation truly outdid themselves during their Starlight Awards on the night of October 23, 2014. From the purple runway carpet to the elegant ambience inside, it was truly a night to remember. Founded in 1982, Starlight Children’s Foundation is a leading global charity that partners with pediatric healthcare, entertainment and technology with a mission to help improve the life and health of kids and families around the world. They have served over 60 million children, teens and families for the past 32 years and with the help of eight different sponsors, such as Disney, Bickerstaff and Yoobi; Starlight was able to raise $153,000 and 500+ water bottles for this year’s Starlight Awards. The signature fundraiser event celebrated philanthropists, innovators and leaders who play an important role in supporting the mission of Starlight. The honorees consisted of actor, RJ Mitte; The Koz Family; co-founder and CEO of Yoobi, Ido Leffler; and CBS EcoMedia. 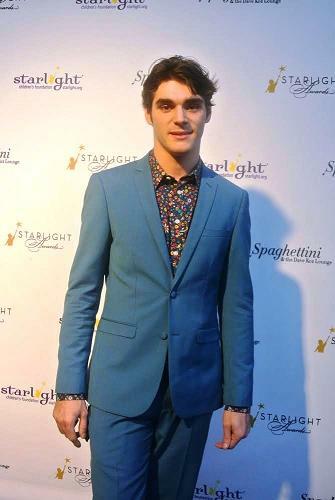 “Breaking Bad” actor RJ Mitte at the Starlight Awards. “It feels incredible to be recognized and to be here with my brother and sister is a dream come true. Together, we can help spread the word of the amazing work Starlight is doing, giving us a platform to talk about that is, great,” said Jeff Koz. Not allowing anyone to convince you that your disability is disabling is something “Breaking Bad” actor, RJ Mitte is known for. Mitte was diagnosed with a mild case of cerebral palsy at the age of three. Throughout his years he has been a role model to many children and teens, especially in the Starlight community. He was awarded with the inaugural Starbright World Inspiration Award. “It’s nice to be acknowledged,” he said. “I do go out and speak for fun and by doing this you’re able to see the world for what it is the good, the bad and the otherwise and I am lucky enough to be able to see it and to be a part of it. It’s definitely a pleasure. I am honored to be presented with this award,” said Mitte. Entrepreneur and CEO of Yoobi, Ido Leffler was presented with the Innovator Award for promoting positive social impact by supporting innovation and advancements for the nonprofit sector. Leffler described being honored as, “truly humbling and a wonderful honor that we (Yoobi) truly cherish”. Yoobi is a new school supplies company devoted to engaging children through bright colors and cool designs while also giving back. For every Yoobi item purchased, Yoobi donates another Yoobi to a classroom in need here in the US. “No matter where a kid lives or what school they go to, they should have the right like any kid to have school supplies,” said Leffler. Since the company has launched, in the past four months, Yoobi has provided free school supplies to over 250 thousand kids. He calls it a “passion project” to help solve a problem. By November 2015, Yoobi aims to impact more than 30,000 classrooms nationwide. Yoobi is available exclusively at Target stores, and at yoobi.com. Seven year Starlight Children’s Foundation Ambassador, Joey Luthman expressed his love for Starlight. With 150 million kids globally under the age of 18 who suffer from chronic illness, Starlight Children’s Foundation supports 500 pediatric facilities that collectively serve up to 25 million pediatric patients per year. Starlight truly does support kids and families from hospital to home and is on the right path in fulfilling their mission.